During his time at Barça, Touré Yaya scored six goals -- against Athletic de Bilbao, Mallorca, Espanyol and Deportivo in the league, against Athletic de Bilbao in the Spanish Cup and against Schalke 04 in the Champions League. The Ivory Coast player was at the Camp Nou for three seasons between 2007 and 2010 and won two league titles, a Champions League, a Spanish Cup, a World Club Cup and a Spanish Super Cup. Search results for: "tourÃ©-yayas-goals-for-fc-barcelona" Home Advertise @bitLanders Browse Movies Help Company Info Privacy. Copyright © 2014, bitLanders. Repeat Touré Yaya's goals for FC Barcelona ... Choose your time range using the slider. Yaya Toure (or Toure Yaya) ... 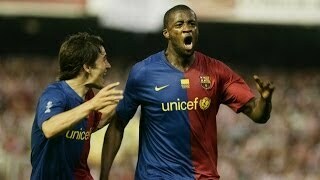 In 2007 FC Barcelona signed Toure for Ã¢â€šÂ¬9 million. ... and scored his first goal against FC Inter in a friendly game. INSIDE CITY 107 Yaya Toure can't stop scoring free kicks!